1 of 2 Heat butter in a 10-inch nonstick skillet over medium heat. Swirl pan to coat. In a medium-size bowl, whisk eggs, egg whites, mustard, tarragon, salt, pepper and nutmeg. Once butter is melted, add egg mixture. Cook, pushing cooked edges into center of pan and tilting pan to coat with uncooked mixture. Continue cooking 5 minutes. 2 of 2 Layer half of omelet with ham and cheese. Tent pan with foil; cook 1 more minute until eggs are cooked and cheese is melted. 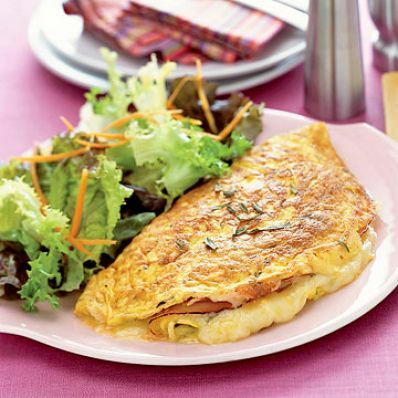 Fold untopped half over filling and slide omelet onto a plate. Cut in half; serve each half with a green salad.